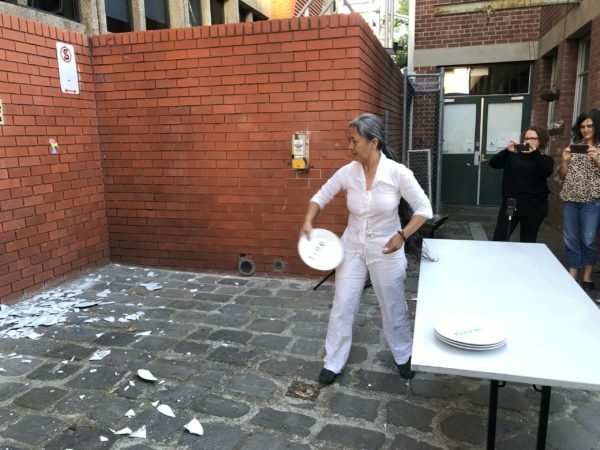 Arahamaiani, one of Indonesia’s most provocative female artists, confidently lifts a single porcelain plate on which she has boldly handwritten the word ‘capitalism’ from a table and hurls it against a brick wall in a small laneway behind RMIT Building 50. 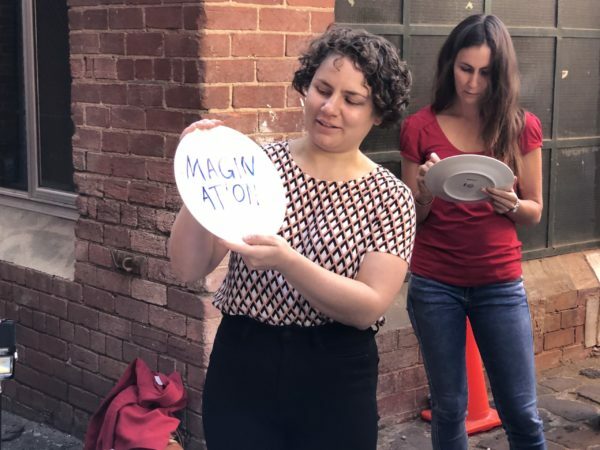 Without losing pace, the artist forcefully flings plate after plate in a minute-long procession of smashing word after provocative word. Shards of broken porcelain shower off the walls, just falling short of the bodies in the crowd. Suddenly, there is silence. 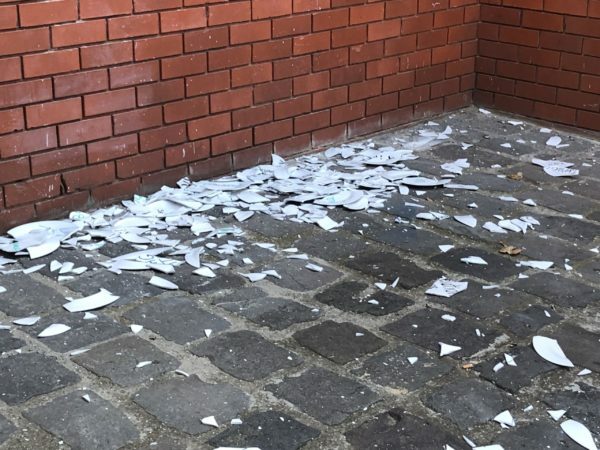 The destruction is complete. 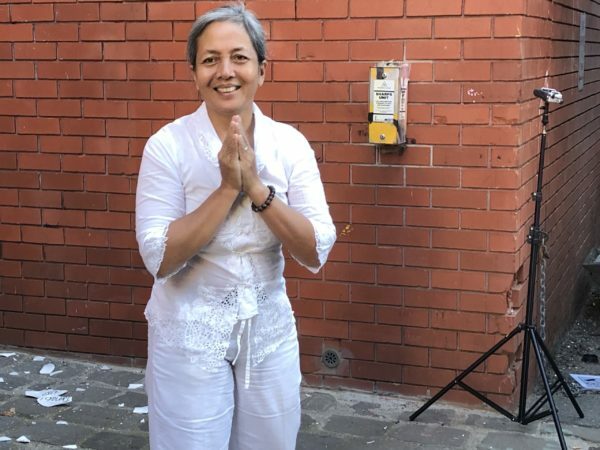 Gracefully, the artist – dressed all in white – straightens her posture and thanks everyone. The audience have come to listen to Arahamaiani talk about her trajectory as a performance artist, and to participate in the presentation of her renowned work Breaking Words. 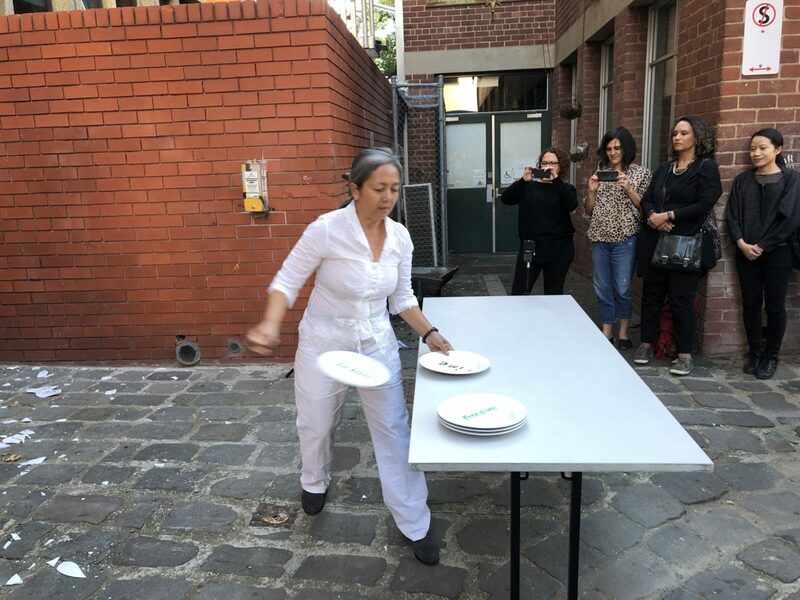 Embodying Buddhist ideologies of temporality and fleetingness, Breaking Words is one of Arahmaiani’s many provocative performances. 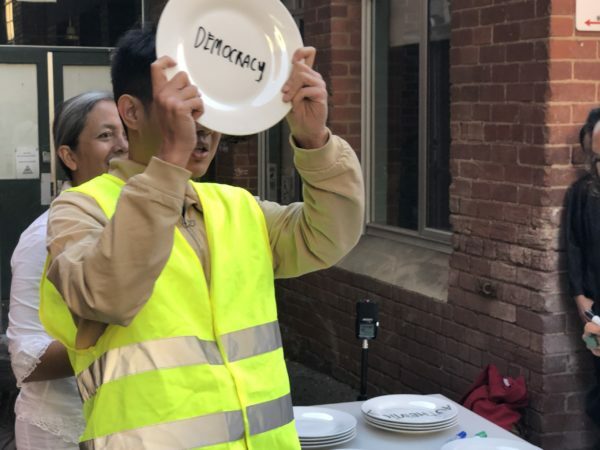 The small invited guestlist, which comprised mostly of students from the Masters of Art in Public Spaces (MAPS) program, were fortunate enough to not only be spectators but participants in the work as well. 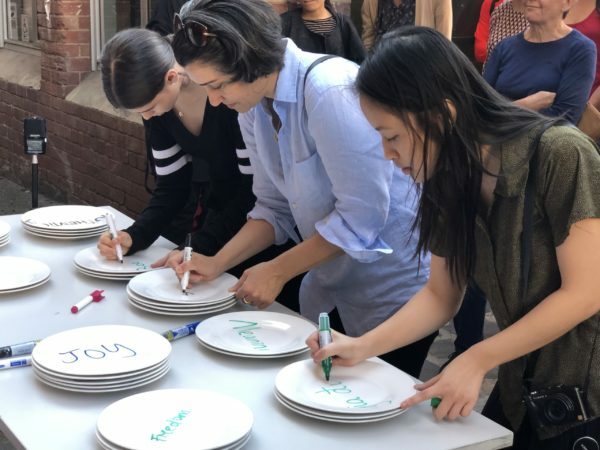 One by one, they were invited to write a single word on the pristine white plates. They were asked to choose a word that had deep resonance and meaning in their lives. 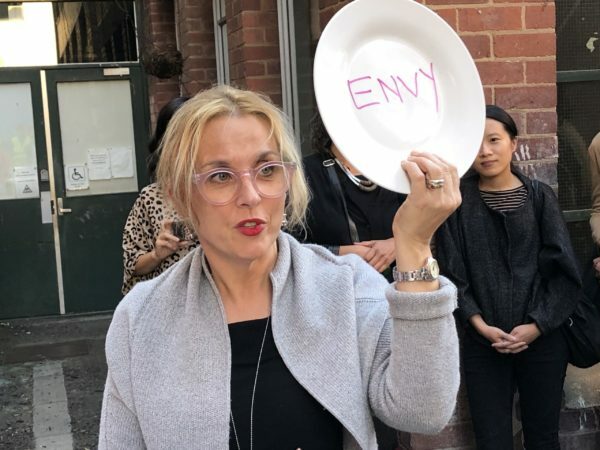 Plates bearing words such as consume and envy were stacked up in contrast to kindness and democracy. 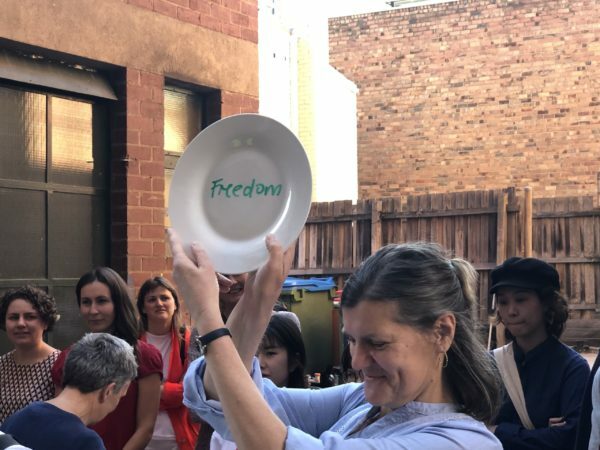 At the end, two plain plates remained from the pile, the empty surface begging to be written on; a keepsake from the artist to RMIT Gallery, that we see as a promise that she will be back soon. 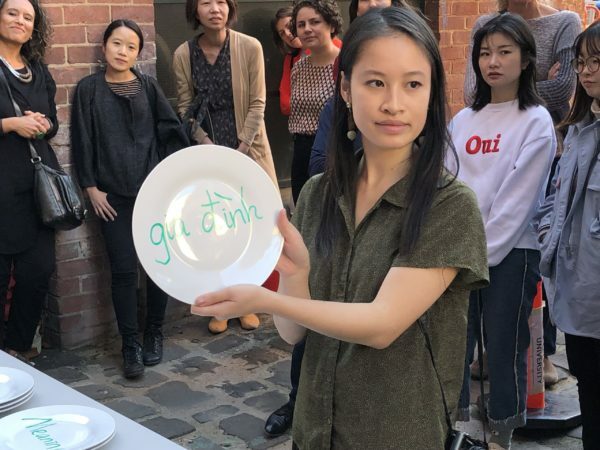 Arahamaiani’s talk is part of the Bruised: Art Action and Ecology in Asia exhibition, curated by Helen Rayment and Thao Nguyen, at RMIT Gallery until 1 June, which features the artist’s stunning installation A Piece of Land for Sale. 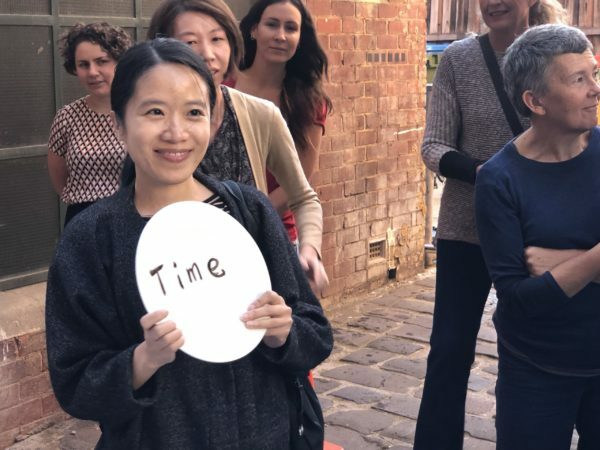 Thao Nguyen is Co-Curator of Bruised: Art Action and Ecology in Asia, and a MAPS student at RMIT.